Lazy Sunday? No, not lazy, just slow. Coffee in the yard, puttering about, catching up on laundry, reading, cleaning out the garage. Summer seems to have arrived. All of a sudden the afternoons are hot and bright, the garden is bursting with green, plants doubling in size overnight. The wet too-long Spring could almost be forgotten, or written off as a myth. The mornings are warm now, so much so that sleeping in has become difficult. The sun is up early and the day becomes alive with birdsong and you can hear that school is out; the neighbourhood is suddenly more filled with children than before. Evenings are balmy once the sun dips behind the skyline. Slowly things begin to cool, the residual heat of the day makes me believe I can stay out in the yard without a sweater longer than I can. By seven o’clock the air smells like barbecue and dinner alfresco seems like such a good idea, you’d think we’d come up with it ourselves. Sunday dinner becomes something off the grill and salad, then a little something sweet. Cool, homespun, drunken fruit on velvet custard. At long last, happy summer. 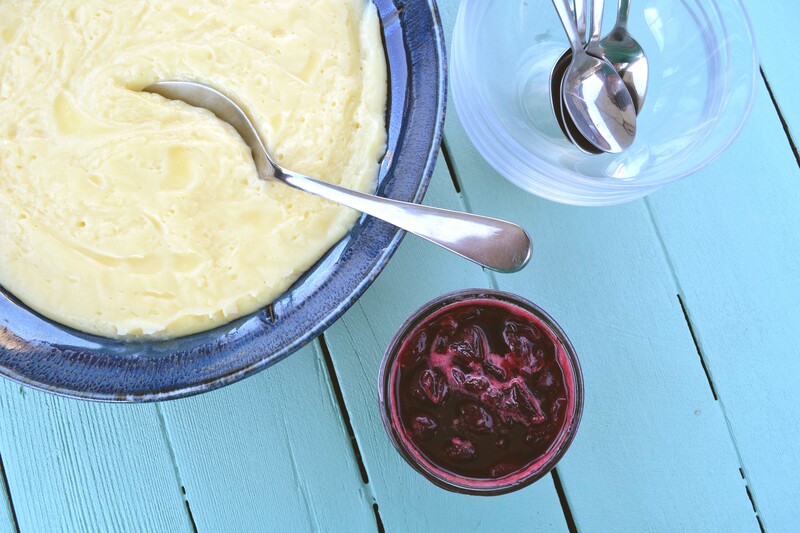 This custard gets it’s richness from eggs and stability from cornstarch. 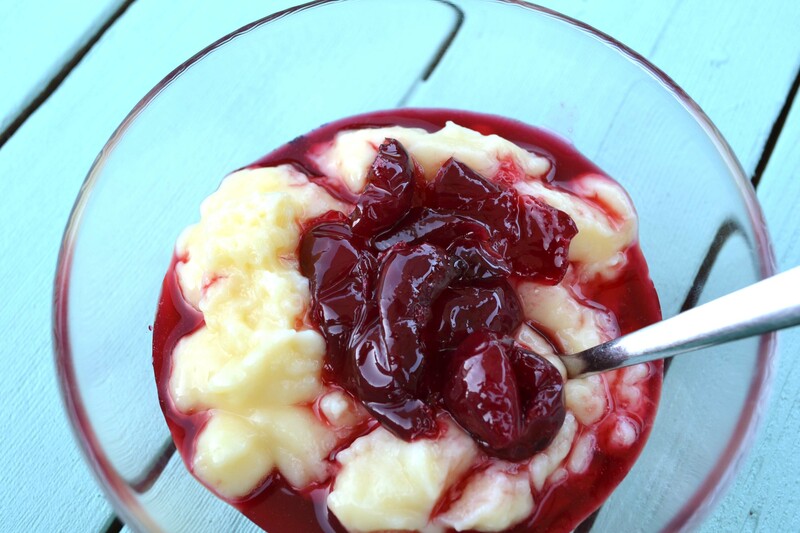 It is loose enough to compliment the syrupy cherries in the recipe below or some crumbled cookies but would also be great as a stand alone dessert. This recipe makes enough for 6, served family-style. If desired, skip the one large serving dish and pour the pudding into 6 chilled bowls or ramekins before chilling until fully set. Choose a serving dish and set it, within arms reach of your cooking area, with a fine sieve in it so it’s ready at the last moment. This custard comes together quickly in the end, and it’s best to be well organized. Custard waits for no one. Measure the sugar and cornstarch into a medium size, heavy bottomed saucepan. Divide the milk into 2 measuring cups, one having 2 cups in it, the other the remaining 1/2 cup. Add the 4 eggs to the 1/2 cup of milk. Break up the eggs into the 1/2 cup of milk by stirring well with a fork. Measure the vanilla and almond extracts into a small glass and set aside. Now that you are ready … Add the 2 cups of cold milk to the sugar and corn starch, whisking well. Cook, over medium heat for about 5-7 minutes, whisking to dissolve the sugar and cornstarch and to prevent lumps from forming. As the mixture starts to simmer it will thicken quite quickly. Whisk continuously until the whisk leaves trails behind it. Remove from the heat. Turn the heat down to medium-low, as you will be taking the pot back to it. Whisking quickly, pour the milk and egg mixture into the pudding, mixing until well incorporated. This will thin the custard slightly. Put the pot back on the stove and cook the custard for 3-4 minutes longer and it will re-thicken. Once thickened, pour the hot custard through the sieve that is waiting in your serving dish — this will ensure that any small bits of coagulated egg get caught and don’t end up in your dessert. Place plastic wrap against the surface of the custard to prevent a skin from forming and refrigerate for 4 hours until firm and cold all the way through. Combine all ingredients in a small saucepan. Cook over medium heat until the cherries have released a lot of juice. Allow to reduce, stirring frequently, until the syrup thickens slightly. Cool to room temperature before using.